Scooter, Bike, and Guitar Painting Too! You can paint plastic body or metal body SCOOTERS using these same materials and methods as well- I did a RAD Scooter paint job using urethane for the backround as well as for the splatter effect as shown below. 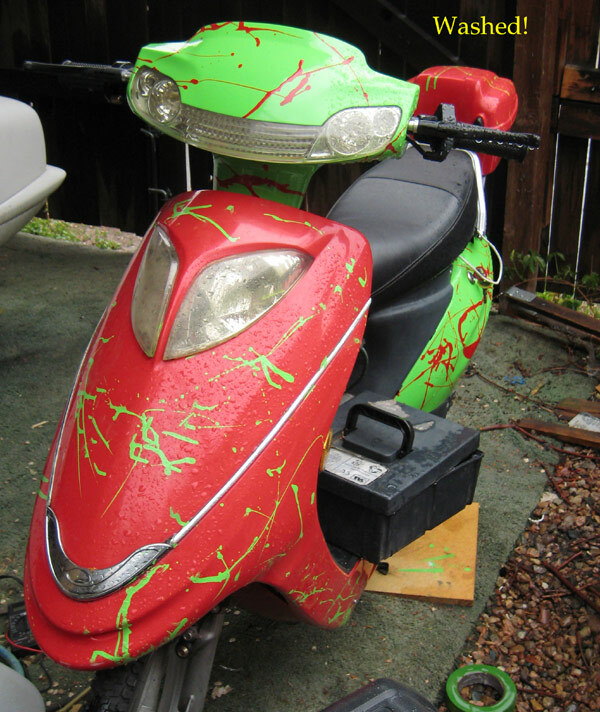 I used both red and green paint on the scooter, with different body parts contrasting for effect. Recently I’ve also painted two BIKES with automotive grade urethane- using exactly the same method I use on my cars. This provides the most durable bike finish you can do yourself. I’ve also painted two GUITARS with the very same kind of paint and method! Again- fantastic durable, beautiful results.